The Tai Chi Training Camp in Toyohashi, 2012 #2: Just liberate your body and mind, and enjoy doing Tai Chi! Next morning I got up at five in the morning to join the morning practice staring at 6:30. I was almost a zombie in such an early morning, but by the time when we finished practicing I felt alive and was hungry. It’s good to be alive! The participants were divided into two groups for the breakfast because it was difficult to have a meal for over 300 people once. My friends and I were in the first group. So I was able to fulfill my stomach soon after the exercise. 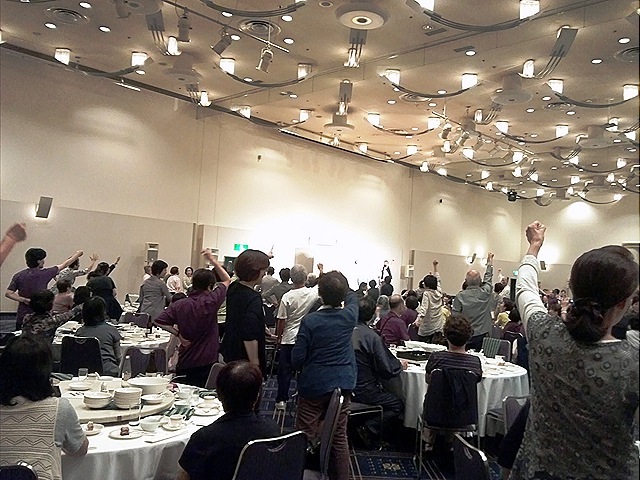 After breakfast, there was an examination for becoming Tai Chi masters. The number of the test-takers was more than 60. They were divided into two and took the trial. They must have been nervous. The audience also felt the tension in the air. 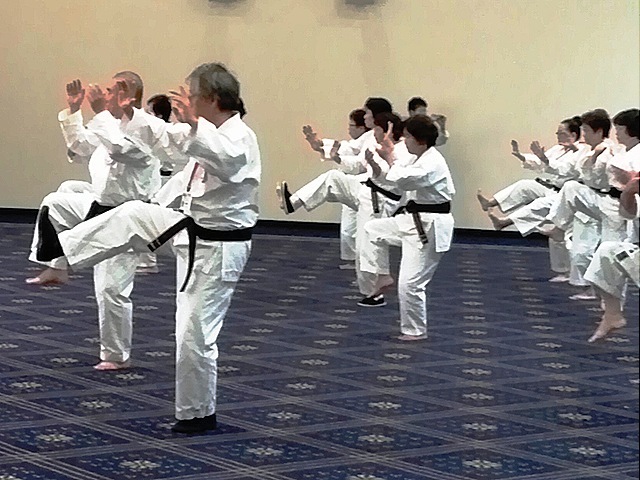 All of the examinees passed the test and have become Tai Chi masters. Congratulations! The closing of the event was the performance by teachers. 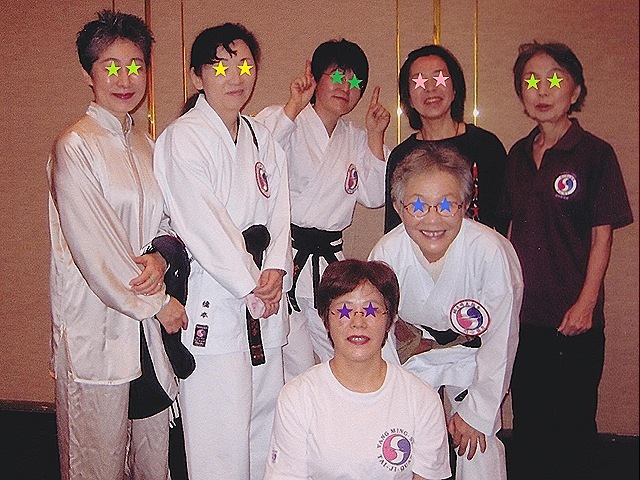 Their Tai Chi was elegant and dynamic, and of course beautiful in a fluid motion. 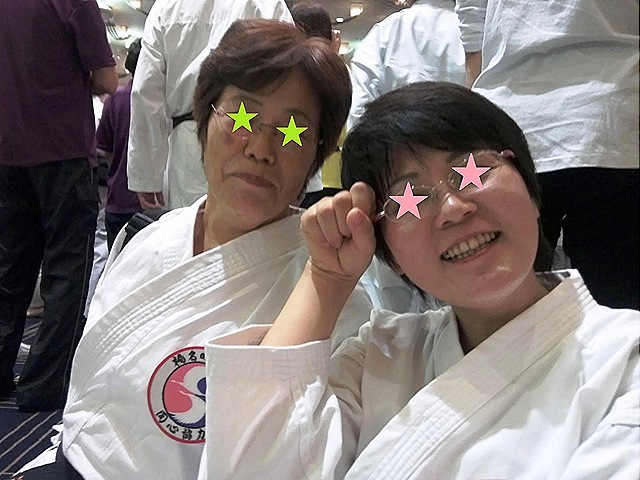 Ms. Kay Yang said that she couldn’t understand her master’s words but couldn’t help but obeying to him at that time. After the DVD was released, many viewers and students bombarded her questions about her error, and she had a terrible time. 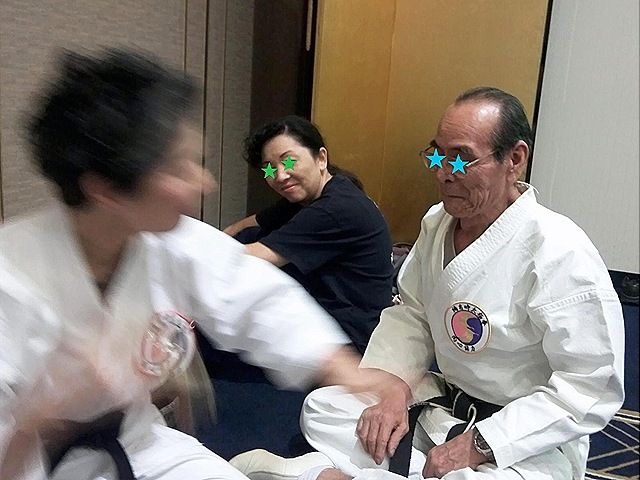 But she said, “Now I understand my master’s meaning.” The most important is not to do Tai Chi like a programmed robot, but is to feel comfortable and to relax while performing. You don’t need to think about the angles of your elbows or hands while doing Tai Chi. You just liberate your body and mind and enjoy the moment while doing Tai Chi. 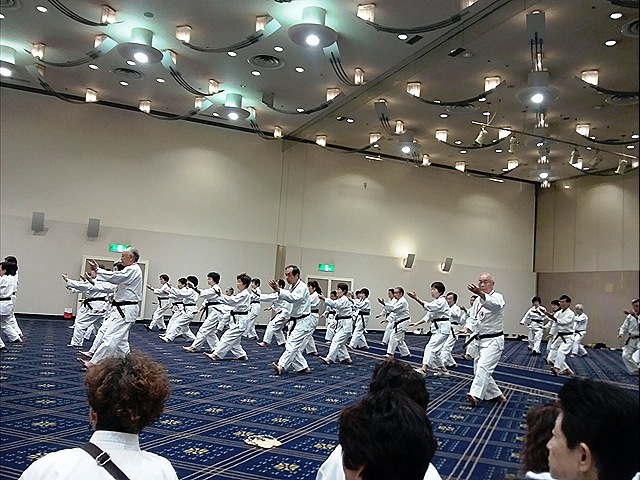 I’m glad to have been in the training camp because I think I got a glimpse of the essence of Tai Chi this time. 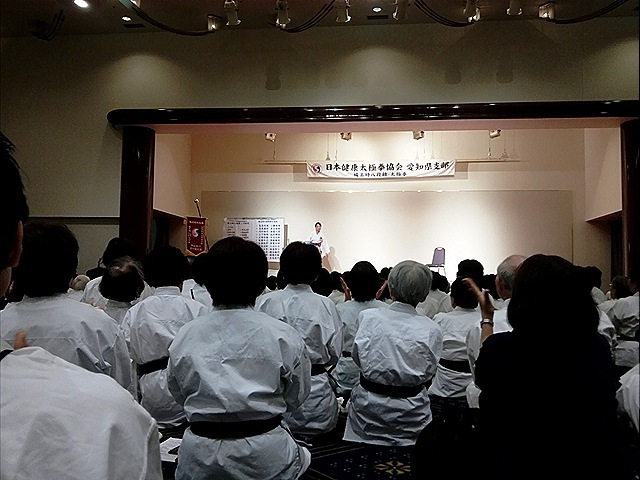 The Tai Chi Training Camp in Toyohashi, 2012 #1: Let’s enjoy Tai Chi! 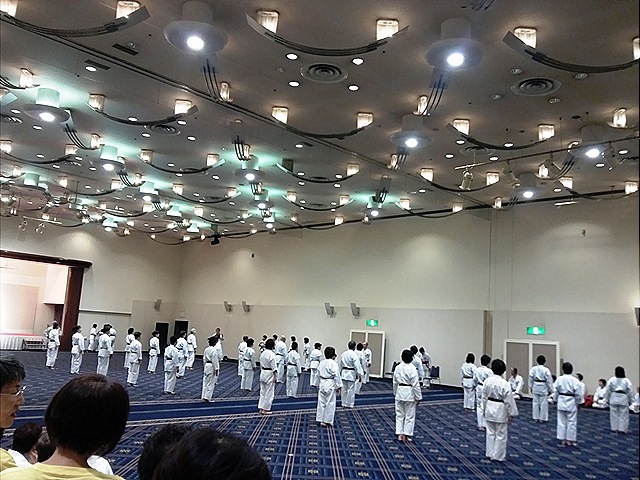 There was an annual Tai Chi training camp in Toyohashi, Aichi Prefecture, on October 6 and 7. 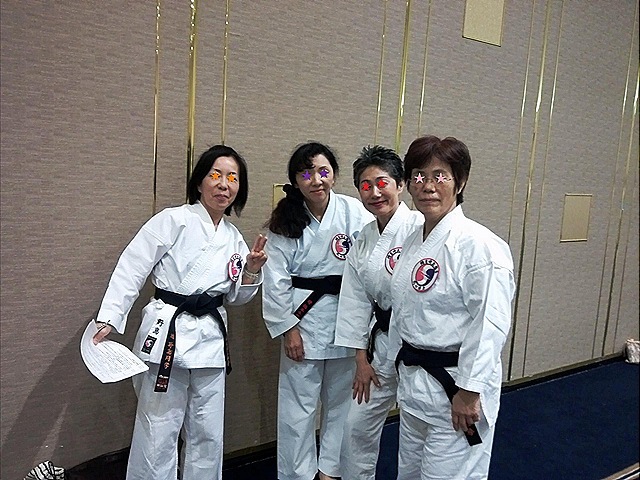 I took part in the event with some of my friends. We met Nagoya Station at 10:00 in the morning and came to Toyohashi together because we were going to catch the shuttle bus which would depart at 11:15 to Hotel Nikko Toyohashi. And we made it in time. But we couldn’t get in the bus because of limited seating. The bus driver called his co-worker to pick us up. So, we gave up the bus and decided to wait for the next bus. But something gave us a lift soon. It was lunch! There are many restaurants around the hotel. So after we arrived at the hotel, we went to one of them, Musashi, the Japanese restaurant. They had a limited offering of 20 lunch specials for 1000 yen: kushi-katsu, or skewered pork cutlets with shredded cabbages, sashimi, nimono, or boiled and seasoned vegetables, chawan-mushi, or a cup of steamed egg custard with vegetables and seafood, tofu, Japanese pickles, rice with green and miso soup. That was wonderful. When Ms. Hideko Hori asked questions with a spirited voice, the students answered in unison. 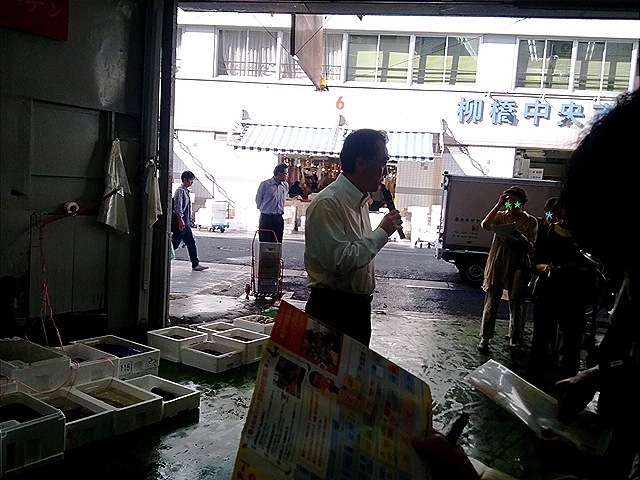 That was one scene of the English Walking Tour in Yanagibashi Fish Market. 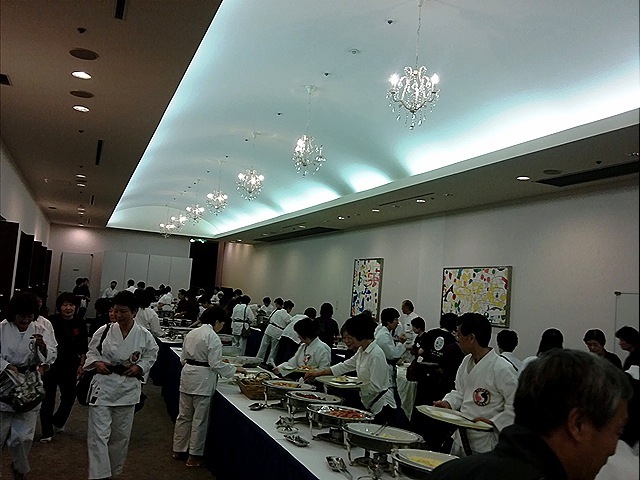 The tour was organized by Chunichi Cultural Center on October 4th. It was not a just tour but an English class. 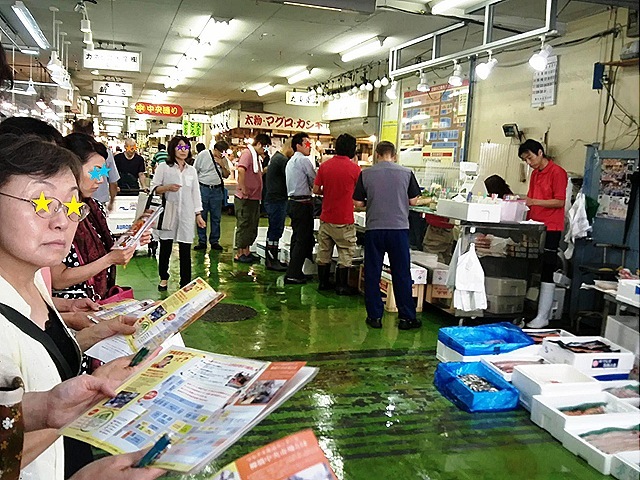 Who led the participants was Ms. Hideko Hori, the English teacher at the cultural center, and she gave a brief lesson to the participants how to explain Japanese things in English for foreign tourists before looking around in the fish market. 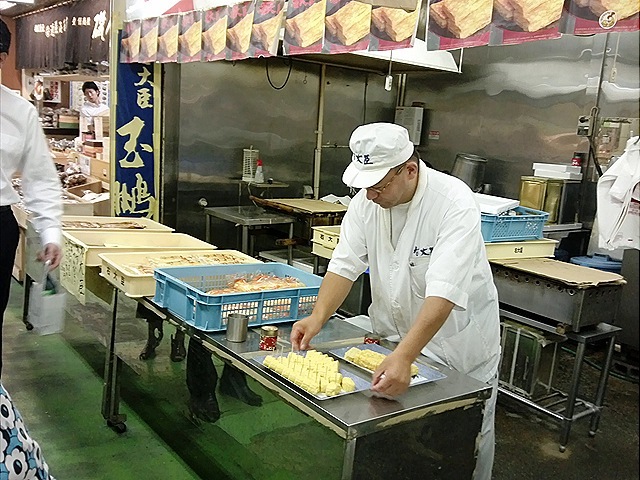 Yanagibashi Fish Market was opened nearly 100 years ago in 1910. 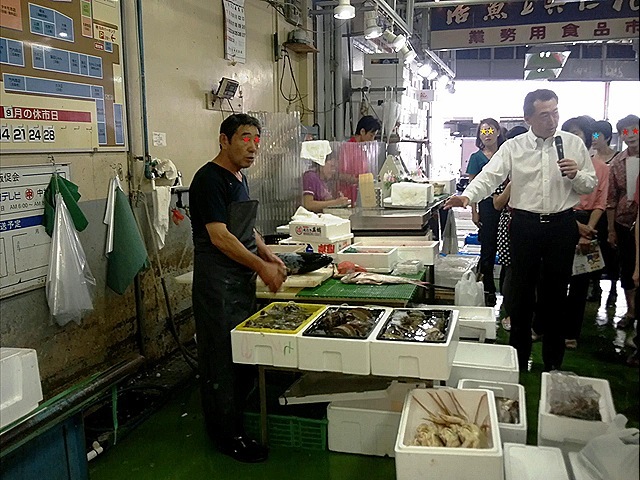 It’s the largest fish market in the Tokai region and ranks second in Japan, next to Tokyo’s Tsukiji Fish Market. 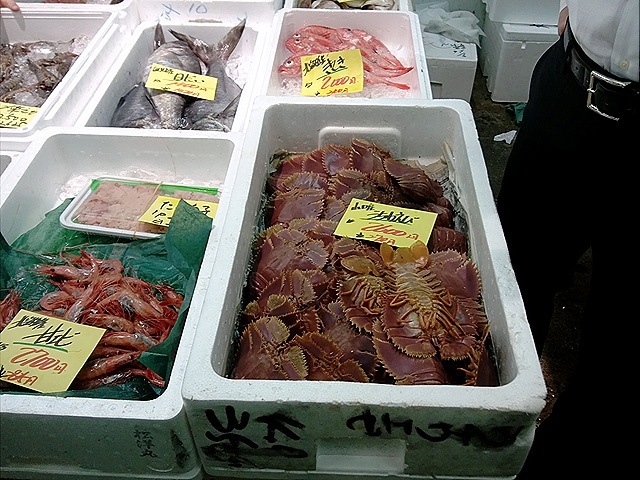 The market is over 13,000 square meters and has more than 300 shops of fish, meat, vegetables, flowers, and dried foods. They offer a wide selection of high quality products because their main customers are professional chefs. 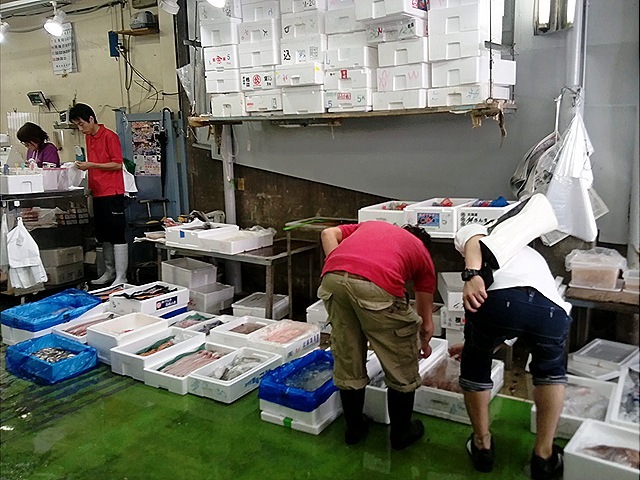 But in this Yanagibashi Fish Market non-professional common people can enjoy shopping. Next we met a vegetable-sculptor. He demonstrated making butterflies by a piece of carrots. 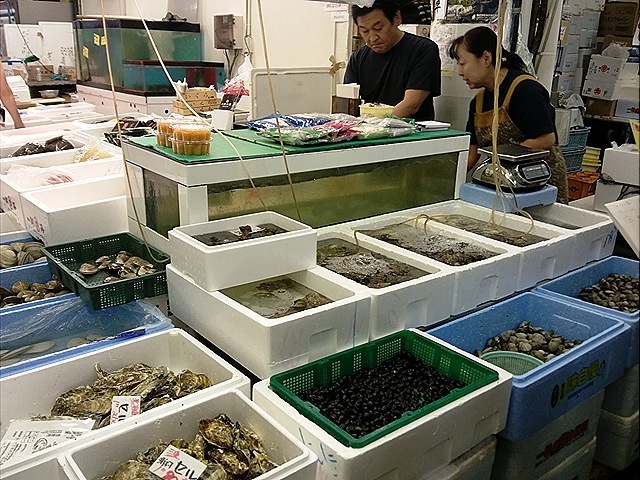 We went to a crab-selling shop, some dried food shops, a meat shop, and a fried-egg-roll shop. Each shop we were offered sample foods, and ended up being full by the time the tour was over. Actually I did not buy anything this time because I had to attend a class at a university after the tour. You know, I cannot bring fish or meat to the classroom…But I enjoyed the tour and learned many things about the fish market. I’d like to visit there again. I’ll enjoy shopping next time! The Trip to Shimanami Kaido in the Autumn 2: Travelling often involves troubles, right? 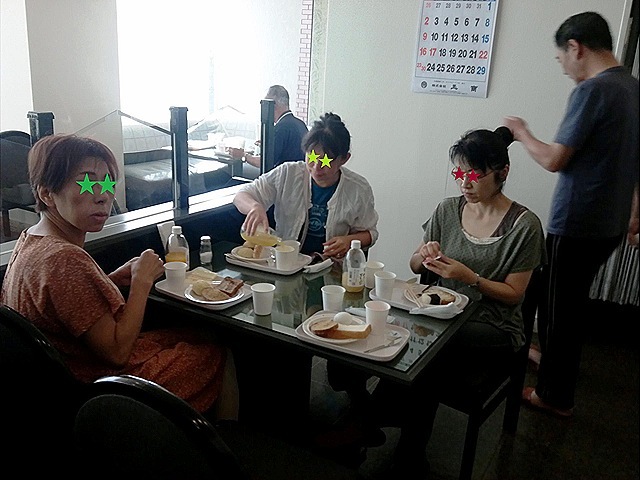 Next morning we got up around seven and had simple breakfast at the hotel in Imabari. We were discussing where to go while eating bread. We almost decided to visit the castle after the meal. But Nakako found interesting information on the magazine which she was scanning. That was about a shop where local specialty products are on sale in an island called Oshima. So, we left the hotel and headed for the island through “Shimanami Kaido” expressway again. Actually, we found out the shop was not so attractive when we arrived at the island. There were not so many things to buy or look at inside. We were disappointed and began talking about our next destination. Motoko said, “I saw a signboard of an observation deck along the way. It’s near the tollgate. Why don’t we go there?” We unanimously agreed to go there. The view from the deck was spectacular! 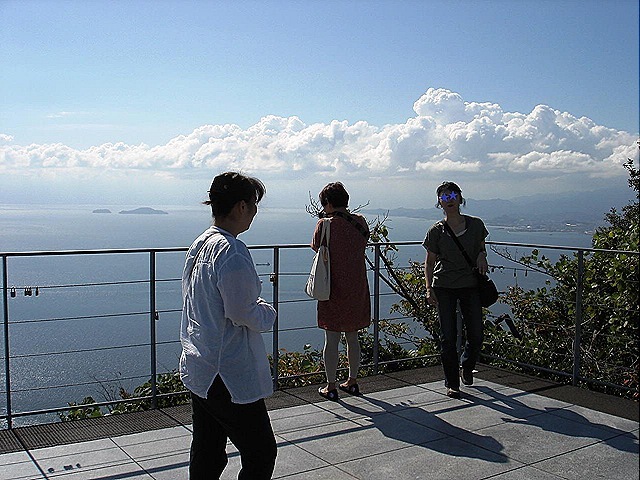 We were able to see 360 degrees of the panorama of the Seto Inland Sea from there. 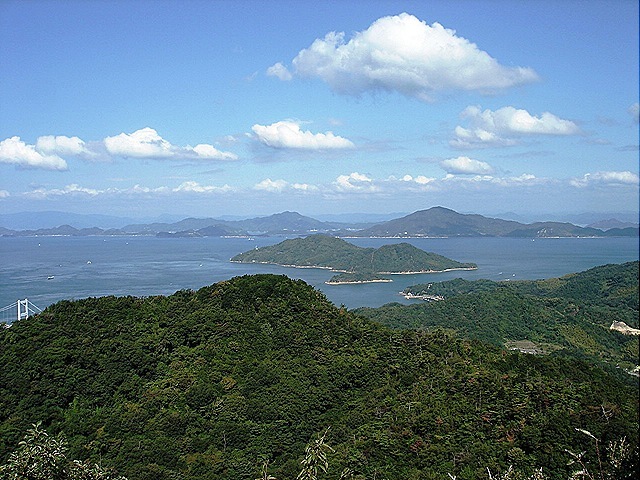 The mountains’ green, the blue sky and white clouds, and the blue and shining ocean under the sun. That was breathtaking scenery. We were really glad to come to the place. We enjoyed the landscape and then had ice cream with salt because the area’s one of specialty products is salt. Ice cream and salt sound strange, but interestingly they go well. 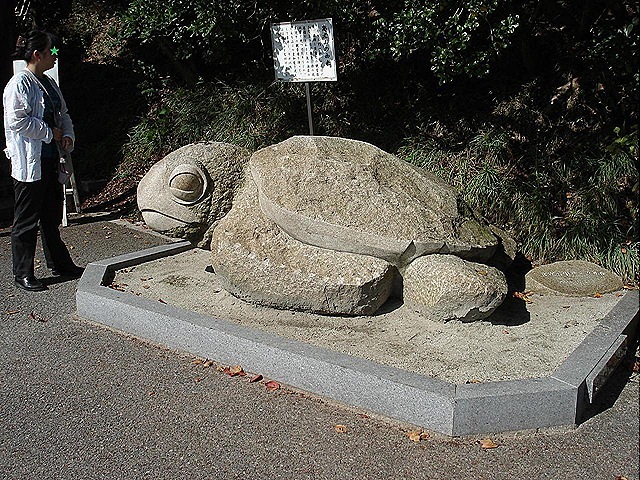 Then we headed for Onomichi in Hiroshima Prefecture. You know, the rest of our three purposes was to see cats there. 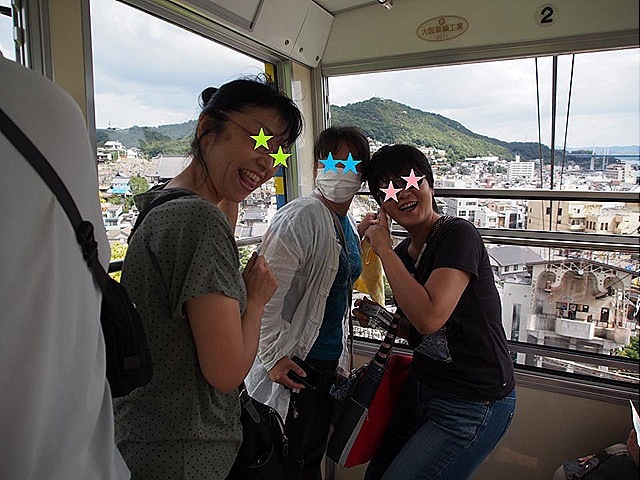 We rode a cable car at the town. There is a mountain called Senkoji-san. Interestingly there are two Buddhist temples and a Shinto shrine on the mountainside. 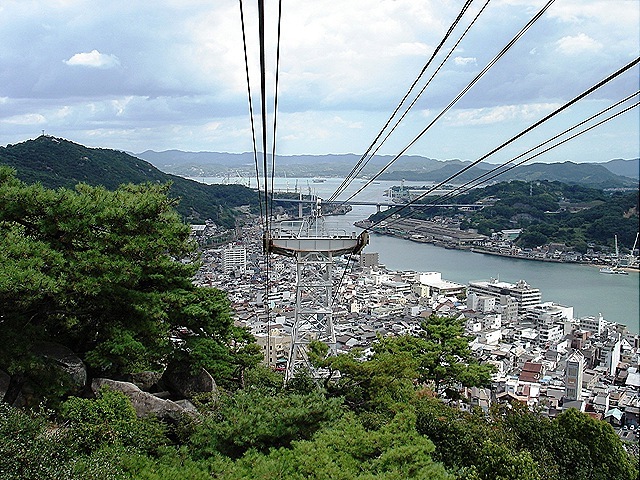 You can go up to and down from the mountain with the cable car. Luckily we were able to see cats on top of the mountain. We were able to fulfilled our three intentions of this travel. 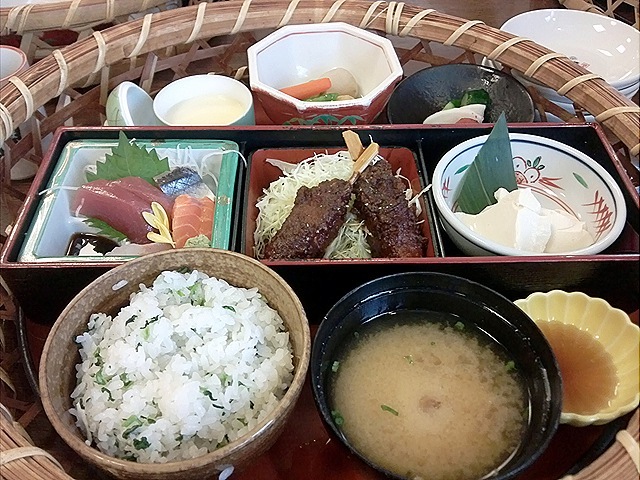 After the mountain, we had lunch in Mihara, which had been our rendezvous point. 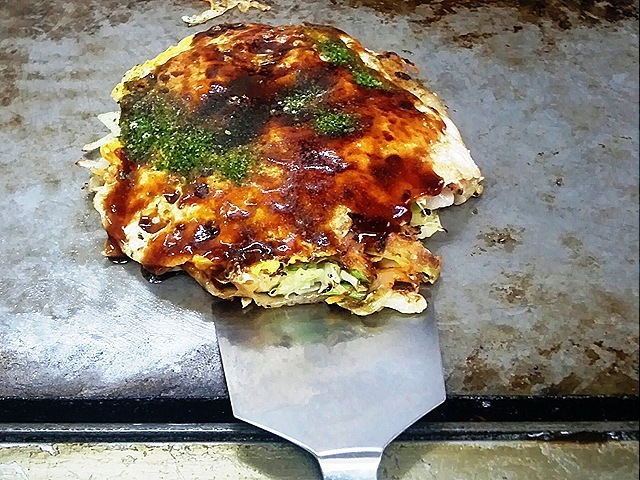 Hiroshima area’s popular food is okonmiyaki, or pancake cooked on the hot plate with pork, an egg, shredded cabbages, and sea food and etc. So, we had okomiyaki for lunch. That was delicious. Actually after lunch, I had to leave for Nagoya. They kept traveling in Hiroshima next day, but I had to say good-by to them in Mihara. I relaxed and fell asleep soon when I got on the Shinkansen and found a vacant seat. Next time I woke up, I didn’t know where I was. The train was stopping at a station, which I had never heard of. Out of my trance, I suddenly noticed that I had got on a train going to the opposite direction. OMG! I was in Yamaguchi Prefecture! Well, travelling often involves troubles…Right? Anyway, I had a great time with my friends through the trip to Shimanami Kaido! 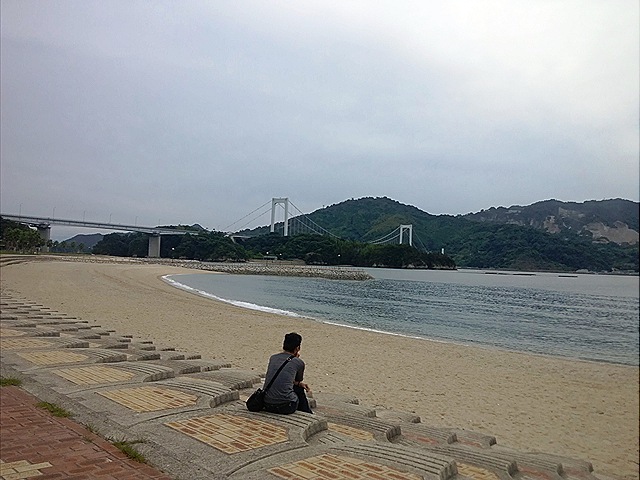 A Trip to Shimanami Kaido in the Autumn 1: Where’s Mihara and where are we going? 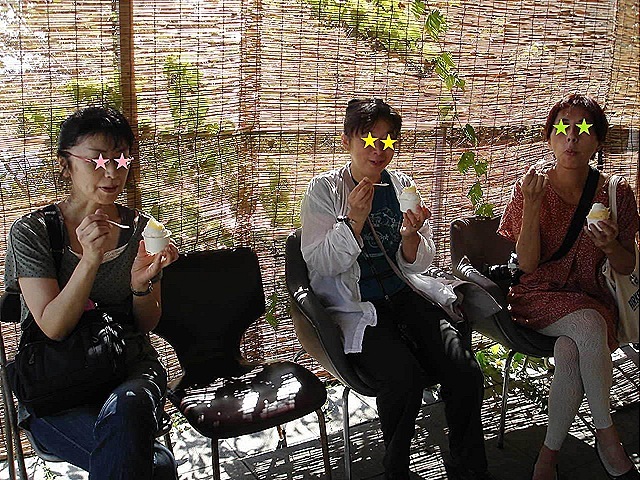 At the end of September I went on a trip with three of my friends: Aya, Motoko and Nakako. We had decided to meet at a station named Mihara and start our journey from there. Actually we live in different places of Japan: Aya lives in Kure, Hiroshima Prefecture (western Japan), Motoko in Kanagawa Prefecture (eastern Japan), Nakako in Ogaki, Gifu Prefecture and I in Nagoya, Aichi Prefecture – Nakako and I live in the region of central Japan, but it takes more than two hours by train to her house from mine. None of us but Aya had heard of the place of Mihara. Why did we decide to meet at the station? I don’t know. Ask Aya. Anyway we had decided to get together at Mihara Station in Hiroshima Prefecture. Aya came there by the local train, Motoko used a plane and a bus, and Nakako and I arrived there by Shinkansen (the bullet train). Luckily we were able to meet each other at the station at 11:00 in the morning! Wonderful! Thanks to the punctuality of Japan’s transportation system! I had not known this but Mihara’s specialty food is octopus. So, there were many objects and paintings of that mollusk. 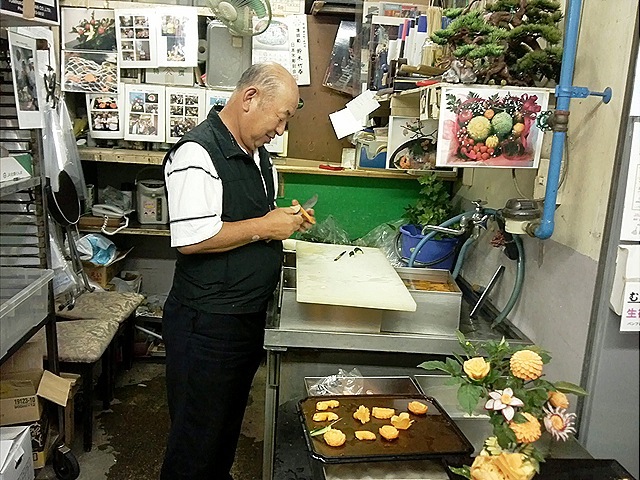 Besides, they produce this strange sweet: “Tako-Momiji“– a maple leaf- shaped sponge cake including sweet cheese cream and a piece of octopus. Of course, I tried one from curiosity. Hey! What’s this? Ah…hmm…not so bad…but…I don’t know whether sweet cake goes well with octopus…Why don’t you try one if you have an opportunity to drop by Mihara? We rented a car by the station and started our journey without deciding where to go. Actually we had three intentions in this trip: to go across “Shimanami Kaido”, to eat chicken in Imabari in Ehime Prefecture, and to see some cats in Onomichi in Hiroshima Prefecture. 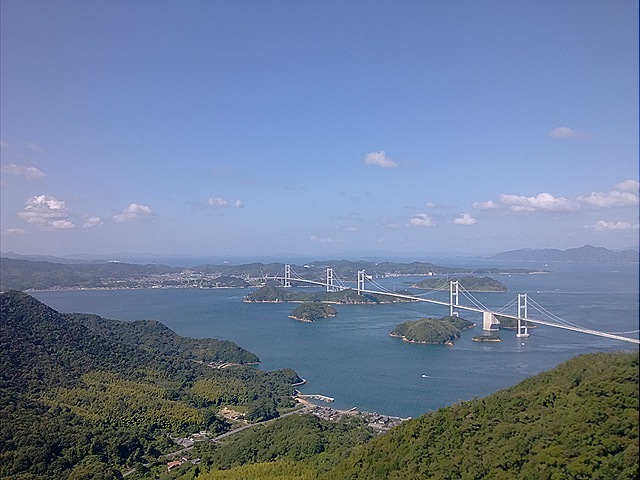 “Shimanami Kaido” is an alias but its real name is The Nishiseto Expressway which contains ten bridges connecting Imabari in Ehime Prefecture, Onomichi in Hiroshima, and nine islands in the Seto Inland Sea. Imabari is famous for chicken though I hadn’t known the fact before the trip. 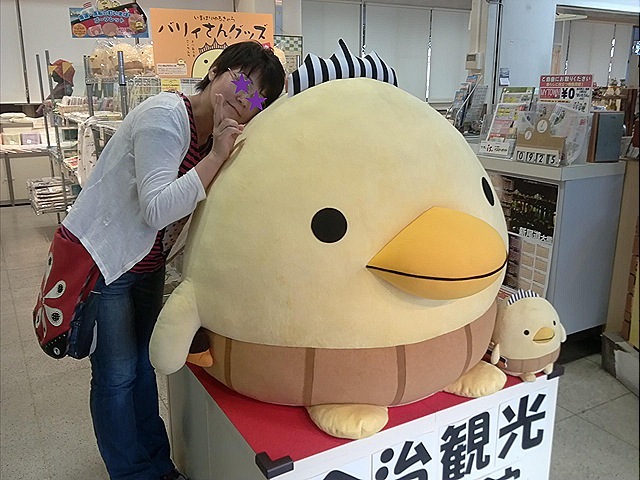 The mascot character in the town is called Bari-san and it is also chicken-shaped. 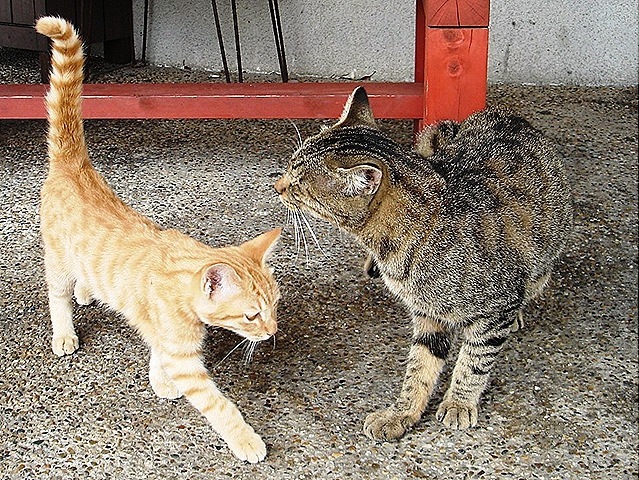 Onomichi is well-known for a movie location and as a town of cats living. 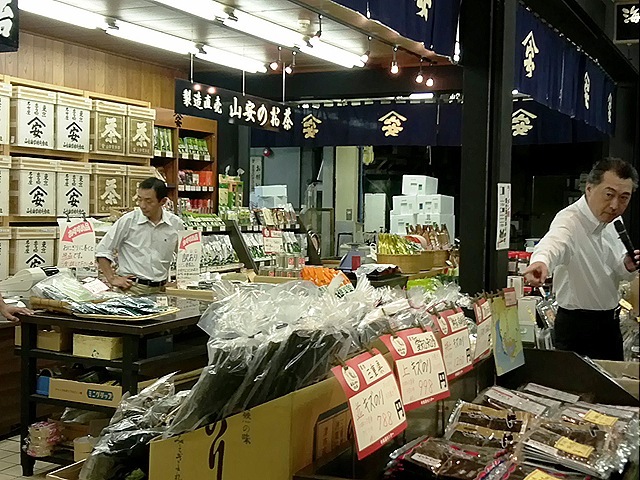 First we dropped into a michi-no-eki, or roadside station, where there are restrooms, restaurants, many specialty products in the place. 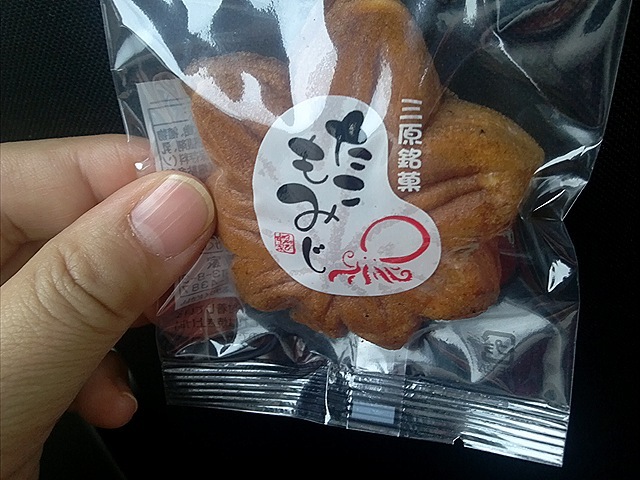 The roadside station was selling many octopus goods because it is located in Mihara. Its toilet’s signs were very unique. 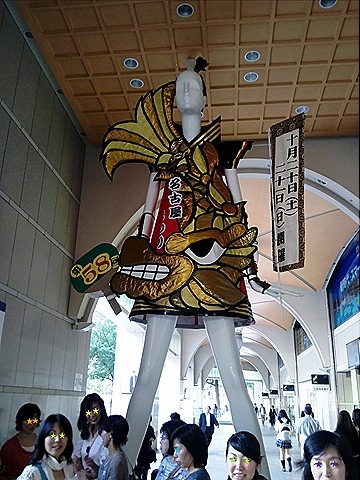 Mihara has a big festival called Yassa Matsuri. 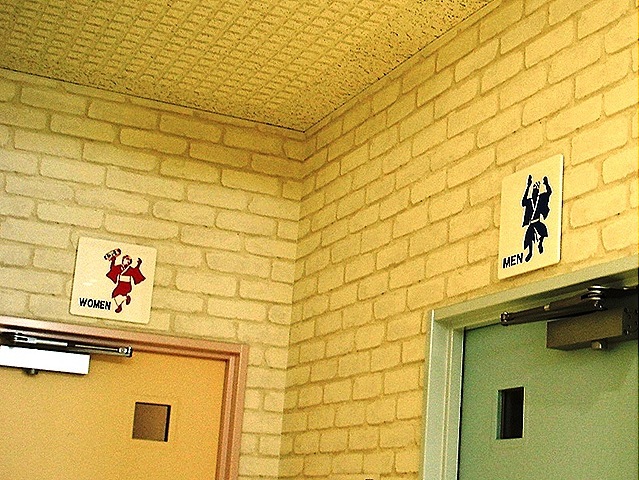 The signs are designed to look like a man and a woman dancing in the festival. After we left the roadside station, we got on the expressway “Shimanami Kaido”, which was one of our destinations. It was a lovely autumn day and the view from the expressway was beautiful. There are nine islands connected by the highway and we decided to come by one of them: Hakata Island, which is famous for producing salt. 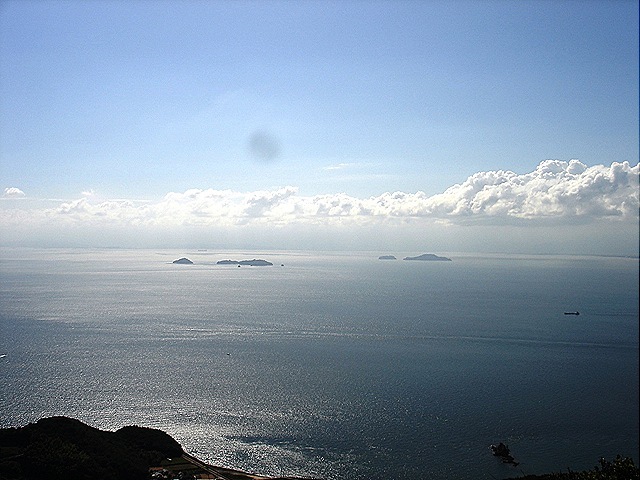 The Seto Inland Sea is often called the Mediterranean Sea of Japan and has a warm climate. That is why many of the islands grow citrus fruits. So, we compared some kinds of citrus juices there. Hmm…every juice was so delicious! 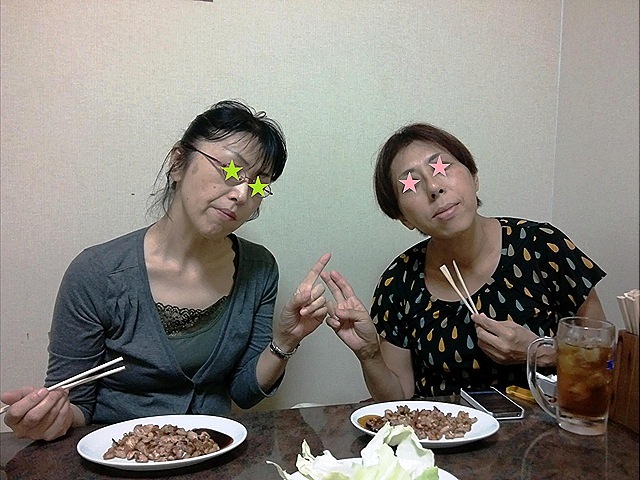 In the evening, we went to eat chicken in Imabari. Interestingly they cook chicken and other foods by pressing on the hot iron plate in the area. Yeah, everything was ironed and served. The figures were squashed and flattened, but the taste was so nice with sweet soy sauce. We stayed in a hotel in Iamabari. They have a big Japanese room and the four of us were able to be in the same room. We chattered many topics, sipping drinks and eating snacks until falling asleep. That was fun…(To be continued later…).